FLINT, Michigan — Mott Community College hadn’t lost back-to-back games since 2008. 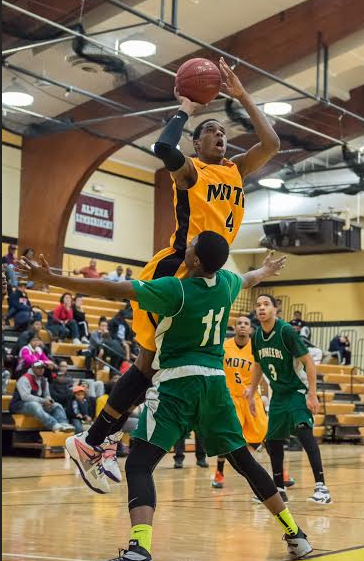 That all changed on Saturday afternoon, as Mott fell to Delta College, 59-55. The Bears are now 11-6 on the season and on track for the program’s worst season since the Y2K scare. The program’s long track record of success, unmatched at this level, makes back-to-back losses feel catastrophic. Perhaps fans shouldn’t blow it out of proportion, but this team is quickly becoming forgettable in the grand scheme of all things Mott. This is a program that could count conference home losses over a 10-year period on one hand (the same hand studded with four national championship rings). I’m starting to think this is the curse of Ralph Eason. The Lions have Bobby Layne, the Red Sox have the Bambino and the Bears have Ralph. The program hasn’t been the same since he ended his career at Mott one year too soon. There was actually a little positivity in the air prior to Saturday’s opening tip, as Mott finally dressed a full roster for the first time since early November. The Bears’ best guard, freshman Justice Green, returned to the lineup, albeit in a more limited role that he is accustomed to. The Bears dressed 11 players including reserve forward Andrew Miller, who made his first appearance in the gold and black. It was all for not, however, as Delta appeared to be the better team throughout the contest, sustaining a late 10-2 run by the Bears, and holding on for the win. This game was another example of something that has happened far too often in the last couple seasons: the team playing “Mott basketball” wasn’t Mott. Delta was more aggressive, played with more intensity and was much more physical. Delta led almost the entire first half, but the Bears cut their lead to two at the break. Mott actually led by four midway through the second half and then again by one with three minutes left. The biggest play in the game came with just 25 seconds left and the game knotted at 55. Delta’s Markell Bradshaw hoisted up a desperation 3-pointer as the shot clock expired that hit nothing but net. That sealed it for the Pioneers, who improved to 11-9 on the season. Bradshaw and Julian Henderson led Delta with 18 points apiece. The only brights spots for Mott were forwards Daryl Bigham and Rod Milton. The pair combined for 31 points and 16 rebounds. Malik Young added 11 including three triples. As a team, the Bears shot a paltry 39 percent from the field. There are too many games left on the schedule to completely write off this season. That said, we know enough about this team to temper our expectations. This is not a championship-caliber team, and certainly not one to intimidate even a middle-of-the-road opponent. After the game, Schmidt said there’s no quit in the Mott Bears. One problem: these are not the Mott Bears of old. There’s plenty of quit in this team. There’s also a precious little care for the outcome of the game, something one cannot help but notice. If your fans care more than your players, there’s a big problem. Four of Mott’s next five game are against teams with .500 or better records. Now would be a really good time to show the rest of the conference you belong. The Bears have a quick turnaround before Monday night’s game on the road against St. Clair. It happens to be very on point about the fans. One thing I that seemed to be an Omen about the game was the closing of the girls game; the Delta Men’s team got behind the women so much that I’ll be willing to bet that a Decibel meter would measure a sound equal to the entire Mott crowd. Once that guy with the jeans started to dribble the ball……….we lost…..bad. (of course in reality that wasn’t the real culprit but…) The women lost focus, gave up before the end of the game and well the men…. One song kept going through my head that day, “Die another Day”. I won’t give up and they shouldn’t give up either. Stats will point out that Mott should win Monday (the men) but I’ll stay home Monday and start to grow out my beard like the baseball and hockey players do.